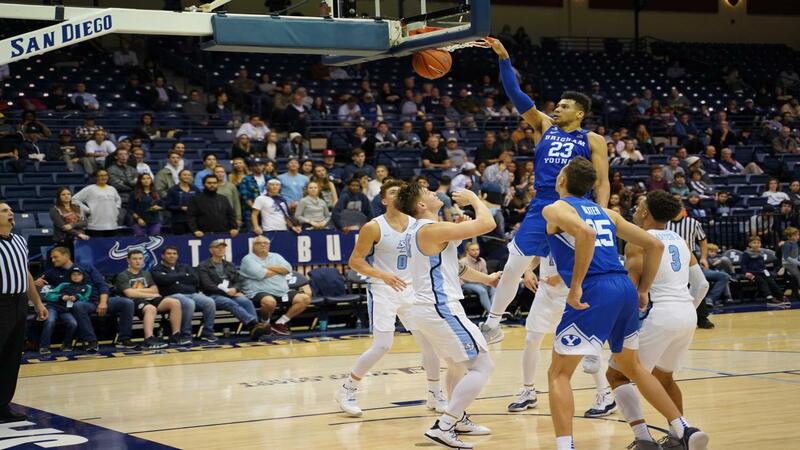 USD suffered another tough loss after leading by double digits to fall to Brigham Young 88-82 in overtime Thursday night at Jenny Craig Pavilion. Five days after losing a heart-breaker to Pepperdine, the Toreros (16-10, 5-6 West Coast Conference) had the same scenario happening to them again. USD led for most of the game and was leading 53-39 with 16:06 left to play before BYU (17-10, 9-3) went on a 31-16 for a one-point lead with 4:23 left. After that point, neither team would lead with more than two points. The Cougars were leading 75-73 with 6.4 seconds left before Isaiah Wright’s easy layup sent the game into overtime. Wright then sank two free throws early in overtime before BYU’s TJ Haws and Yoeli Childs took over with a 7-0 for an 82-77 lead. The Toreros twice pulled within two points but Haws made a jumper followed by four free throws to seal the deal. Up next, the Toreros host Gonzaga, a team they lost to in a close match weeks ago, at 7 p.m. Saturday.